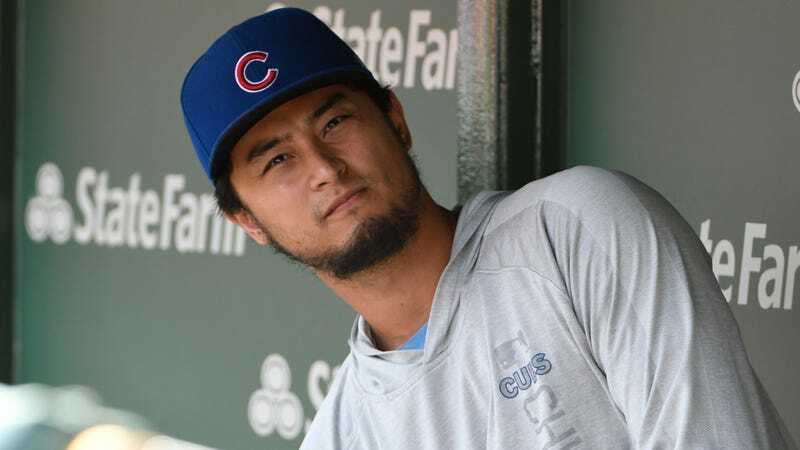 Following a minor-league rehab start on Sunday that lasted only one inning, the Chicago Cubs have shut down pitcher Yu Darvish for the remainder of the season. Darvish, who had only appeared in eight games this year, went on the DL with a triceps injury in late May and hadn’t returned since. The MRI following his rehab start showed that Darvish had a stress reaction in his right elbow, as well as a triceps strain. Even if this news isn’t entirely shocking, it’s still a pretty big blow to the team. Darvish’s health is important to the franchise in the long term—the 32-year-old is signed through 2023 on a $126 million contract—but a healthy Darvish could have been a major boost to the team’s World Series hopes this year. The Cubs are currently holding on to a three-game lead over the Brewers in the NL Central, but that’s no thanks to their starting pitching. While recent acquisition Cole Hamels has been on a stellar run with an 0.72 ERA in his first four starts for the Cubs, Jon Lester (4.83 FIP) and Jose Quintana (4.77) are both on track for career-worst seasons, and Kyle Hendricks’s stuff has taken a noticeable dip since his dominant 2016—particularly in the extra 0.53 dingers he allows every nine innings. Also, Tyler Chatwood exists. It’s near the end of August, and despite the cheap pick-up of Daniel Murphy from the Nationals today, nobody is coming to save the Cubs’ rotation. Their current starters may be experienced, but in 2018, they’ve been far from inspiring. With Darvish shut down today, the Cubs will have to make do with what they have. Maybe the revitalized Hamels can pitch every game.